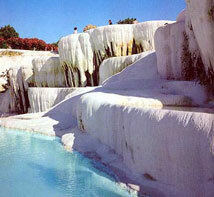 Pamukkale is one of the natural wonders of the world. It is a unique geological formation formed over 14.000 years. The spring water at Pamukkale has therapeutic qualities and since antiquity has been said to cure rheumatism, kidney and heart diseases. Hierapolis, means sacred-city and its history goes back 6th C BC. At its peak the population reached about 100,000. The ruins at Hierapolis cover an extensive area. The theater, Temple of Apollo, Colonnaded Street, Byzantine Gate, Plutonium and Necropolis (Cemetery) are some of the highlights of the city. The Necropolis has approximately 1000 tombs and is the largest in Asia Minor.